This is a postcard to thank all my readers. Back in May I asked for help purchasing gear for the Adventure. Scores of readers came through and helped raise hundreds of dollars. The gear you funded is a blessing. It’s proved its worth every day of my trip. I promised that high-end donors would receive postcards in the mail, and the first batch of those go out today (if you’re expecting one and don’t receive it, let me know!). But I also wanted to do something special for all of my donors—every single one of you who helped contribute to launching the Great Adventure. Thank you. And many thanks to each and every reader. Your support, your clicks on the Tweet button, your Facebook shares, your comments and your kind words all help keep me going. This is a nostalgic place. Minneapolis used to be a flour town, the mills driven by St. Anthony Falls in the Mississippi River. Old mill buildings cling to both banks. The graceful Stone Arch Bridge reaches across. One side of the falls is where my house (and temple) was, when I lived here; the other side is what you see pictured above. 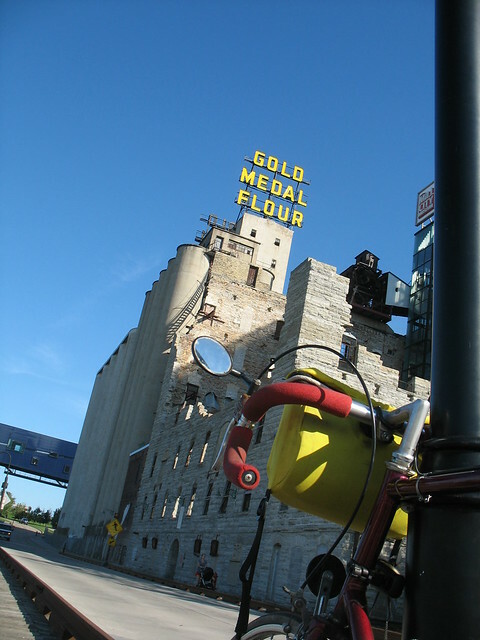 The Gold Medal Flour mill was partly destroyed in a fire, then sat vacant until the Minnesota Historical Society turned the ruins into a museum. Incidentally, I used to work at the Historical Society. I’ve walked there many times. Across the river, friends and I came out of movies and argued plot holes over drinks. When I broke my ankle I walked the bridge to strengthen it up. And many nights I coasted past this lamppost, deep in troubled thought about how to put adventure back in my life. Now I’ve gone there perhaps for the final time, and I knew it was the picture to send to all my rogues. Thanks Drew! Mad love to you too. May the God’s be with you and watch over you. Gorgeous picture, and a gorgeous post. I love it :) Happy adventuring, Drew.